I call these gratitude brownies. Gluten free, grain free, dairy free, sugar free and nut free, these brownies not only make you feel grateful for all of the ingredients they contain that enrich life here on earth, but also for every single thing going on in your life at this moment in time. You could call them stress-releif brownies, you could call them break-up brownies, you could call them holiday-blues brownies. What i'm trying to say is, no matter what life is throwing at you, making (and then demolishing) a batch of these brownies will make none of it matter. You'll instantly feel grateful for all the good in your life, focussing on everything positive (predominantly, the brownies that sit before you), and momentarily leaving behind any bad/negative thoughts/issues/situations. It's like these brownies take your problems and pack them away into an insignificant little box never to be found, creating more space for you to dwell on the positive aspects of your life. I guess you could call them feel-good brownies, but thats a little generic. Name them as you see fit. Today, these are Easter brownies. 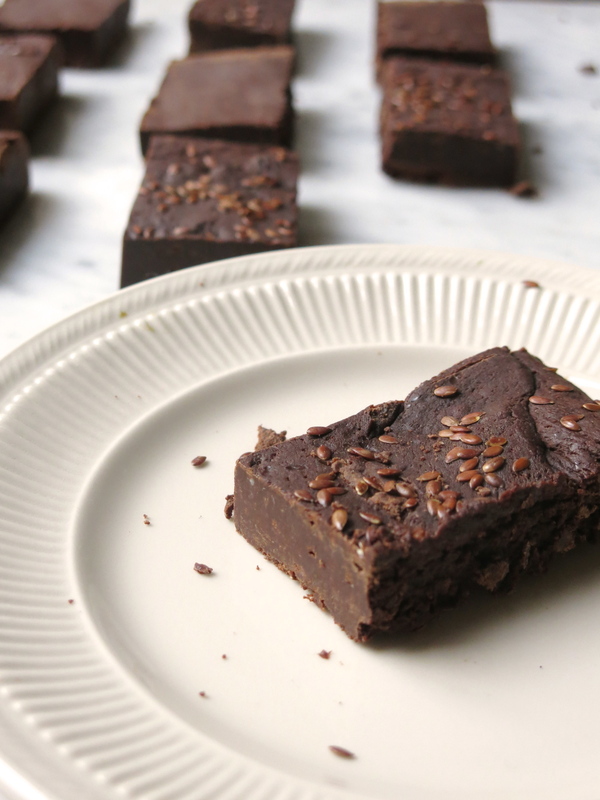 And also it's-so-grey-outside-lets-brighten-things-up brownies. Makes 10-12 large brownies, or enough batter to split between two tins for thin brownies. + These brownies are incredibly decadent and dense. They aren't fluffy or cake-like, and once chilled in the fridge they stiffen and begin to resemble fudge. For a cakier, lighter version, use less coconut oil and use ground almonds and dates, instead of buckwheat flour and sugar. I'll develop a precise recipe for these in the next couple of weeks. Preheat the oven to 180c. Grease a heat proof dish with a little coconut oil. (You can line the tin with baking paper, but if the mixture sticks to that, it isn't as fun to salvage and is extremely frustrating to separate the paper from the brownie). Start by melting the coconut oil in a large sauce pan over a low-medium heat. Whisk in the cacao powder, vanilla, maca and agave. In a separate bowl, measure out the flour and salt. In another bowl or a wide mouth jug, whisk the eggs with the sugar until completely combined. When the coconut oil and cacao has dissolved and come together, remove from the heat and allow to cool for a few minutes. Then, whisk the sugar and egg mixture into the chocolate, working quickly to avoid allowing the egg to cook in the warmth of the chocolate. Next, add the flour, a few large tablespoons at a time, and whisk constantly. When everything is combined, pour the batter into your prepared tin and bake for 30-45 minutes. I like to take mine out when the middle is still a little gooey, as they will continue to cook as they cool, and this will leave the middle incredibly chewy. If you cook them for too long, they may end up too dry. + I prefer these cold having been chilled in the fridge. Serve with coconut cream or top with avocado cream, almond butter or tahini frosting. Shortbreads, despite their three main components being butter, sugar and white flour, have proven to be one of the easiest things to make healthily. I substitute the butter with coconut oil, the sugar with coconut palm sugar or natural fruit sugars/syrups, and the white flour with buckwheat flour, oat flour, or nuts ground into a flour consistency. From there, it is easy to add other ingredients to increase the nutritional profile of your biscuits even more - such as superfood powders, raw vegetables and linseeds/flaxseeds or chia seeds. You can also very easily make these into savoury or sweet biscuits, simply reducing the amount of coconut palm sugar or syrup used for savoury biscuits (and adding vegetables, more flour and nutritional yeast for a cheesy flavour), or increasing the coconut palm sugar or syrup quantities to your personal taste, and adding things like low fructose dried fruit and super foods like maca and cacao. Once you've got the base down, you can add pretty much anything. And you don't have to skip the icing either! Creamed coconut is a mysterious ingredient and, as it sets, resembles sugar icing almost exactly. I actually prefer it, as it has a nicer texture, a creamier flavour and doesn't leave a strange aftertaste or sugaring coating in your mouth after you've eaten it. While some of the colouring items are quite an investment, they're definitely worth it. I alternate adding each one to smoothies, porridge and soups as well. This weekend I am rather excited to announce that I am officially contributing to Miss Vogue. I will be creating and writing up exclusive monthly breakfast recipes for the magazine - all of which will be in keeping with the model mange tout philosophy; free from gluten, grains, dairy and refined sugar. My first recipe is one of the most exciting breakfasts you can imagine. Not only does it make eating cake for breakfast acceptable even though it isn't necessarily your birthday, it is also a beautiful colour and is made using only nourishing ingredients and super foods that will lift your mood and boost your energy levels. See the full post and see more images here. The sponge is made from ground almonds and buckwheat flour instead of white flour, so it's completely wheat- and gluten-free. Similar in texture to a pancake, but thicker and cakier, it's high in protein from the nuts and quinoa yet also incredibly light - so it'll satisfy your hunger without making you feel too full. It may seem strange to put sweet potato into a cake mixture, but it bakes to the perfect texture, and adds a natural sweetness, meaning you don't need to use as much sugar as you'd think. The only other sweetness comes from coconut palm sugar - a natural sugar that undergoes very little processing, so the vitamins and nutrients remain in tact. Preheat the oven to 210C. In a baking tray or a heatproof dish, arrange the berries and uncooked quinoa to cover the entire base, then set aside while you prepare the topping. In a medium bowl, mix together the flour, almond flour, coconut sugar, honey, salt and baking powders. Stir with a whisk or a wooden spoon to combine. Next, take your coconut oil and, if it is solid, heat it in a heatproof bowl in the oven or a small saucepan over a low heat until it melts. Pour into the flour mixture along with the almond milk. Now add the grated sweet potato, mix briefly and transfer all of the ingredients to a blender or food processor. Add the eggs and blend for 1-2 minutes until the mixture is smooth, then pour the batter over the berry and quinoa mixture. Ensure all of the berries are covered and gently nudge the mixture to make sure that the batter reaches between the berries. Place in the oven and bake for 20 minutes, then turn the heat down to 180C, and bake for a further 25 minutes. Let it cool before cutting and serving. Serve warm with pea cream (below) or coconut cream or yoghurt, and extra fruit or berries. Also enjoy cold, as an afternoon snack with a warm drink. This dip, or cream, seems incredibly odd, and probably looks more like it should taste savoury, not sweet. However, peas have a naturally sweet flavour, and when combined with creamy coconut milk and coconut oil, they taste kind of like melted ice cream - perfect to accompany any dessert, or on top of porridge. Enjoy it instead of yoghurt, with fruit, berries and granola or Qnola. Peas are high in protein, antioxidants and phytonutrients but low in fat, and by transforming them into a delicious dip, it easily makes up one of your five a day. Simply place all of the ingredients into a blender or food processor and blend for 2-3 minutes until entirely smooth. Frozen peas will make the cream thicker and chilled peas will make it softer and smoother, but it will thicken up in the fridge a little as it sets. Serve chilled with dessert or breakfast. Banana bread is one of those things. One of those things that makes the house smell good and warm, and welcoming for days. One of those things that tastes like what I imagine it must be like to eat a slice of love. One of those things that, upon consumption, wherever you are instantly feels like home. One of those things that actually tastes like home. One of those things you eat and then realise you haven't been listening to conversation or taking in anything around you, because for a moment, it was just you and that slice of warm banana bread and nothing else mattered. Banana bread is one of many things then, I guess. For me, banana bread reminds me of my home home - the place i grew up - and of my eldest sister, who was always greatly attached to it. I remember we'd have it at every picnic and for every birthday, smothered with our Aunty's dizzyingly good cream cheese frosting. 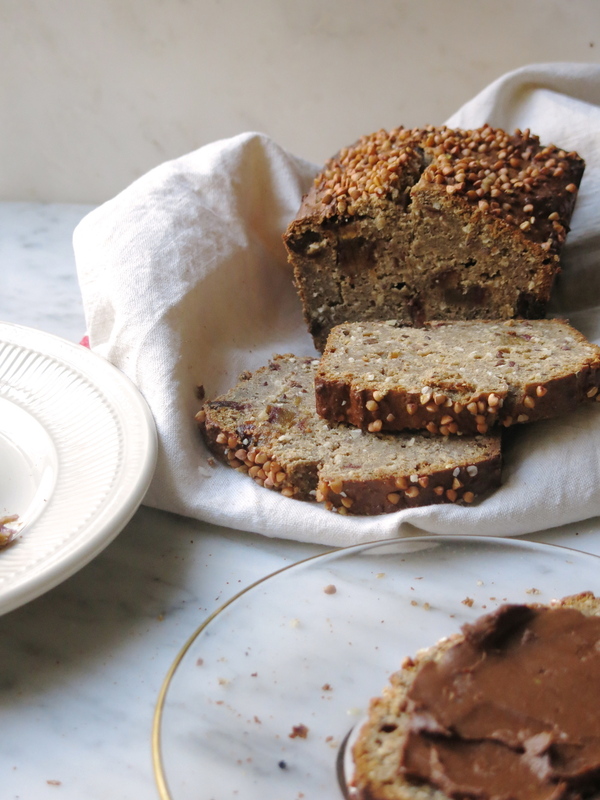 This recipe, as always, is unlike your conventional banana bread. There is no wheat, dairy, refined sugar or grains, and you can work it around your own requirements - for example using all buckwheat flour to replace the ground almonds for a nut-free variation, or playing with the sweetener quantities to suit your taste. You don't really need sweetener at all in this recipe, as banana's are incredibly sweet themselves (and so are you). This bread is perfect as a breakfast treat, and if you make it one sunday evening when you've time to spare, it can last you the rest of the week, making an instant breakfast on-the-go, the perfect energy-rich snack or an offering if you have guests over for a cuppa. Lovingly spread it with Raw Chocolate Avocado Spread (recipe below), and kids will be all over it, without a care in the world that it contains fruit and super foods and is actually good for you! + Note - for a lighter bread, use one extra egg, and replace the buckwheat flour with ground almonds. + You can also experiment with making this bread into a savoury sandwich bread. Simply reduce the sugar quantity to 2 tablespoons, use only 1 banana and 2 grated courgettes, and add plenty of fresh herbs and a tablespoon of nutritional yeast. Break the bananas into a bowl and then mash them until they become smooth and thick, but not lumpy. Measure the coconut oil, eggs, sugar, vanilla, salt and herbs and spices of choice into the bowl and mix using an electric whisk (you can also do this in your blender to ensure a smoother mixture, and less effort!). Once the ingredients are coming together, add the bicarbonate soda or baking powder and the lemon juice, then the buckwheat flour, ground almonds, milled chia seeds, golden linseeds and desiccated coconut. Whisk a final time, and then stir in the chopped dates, along with any nuts/seeds/cacao/chocolate of choice. Sprinkle with the toasted buckwheat, and nuts/seeds if you wish. Place in the preheated oven for 1 hour 20 minutes. The outside becomes so crispy whilst the inside remains dense, spongy and moist, and full of flavour and texture. Serve with Raw Chocolate Avocado Spread (below), pure tahini mixed with honey or coconut nectar, Berry Tahini Cream, Organic Butter, Ghee or Coconut oil - toasted or warm from the own. Makes roughly 10 servings as a spread. Store in an airtight container and use on cakes, porridge, pancakes, fruit and, well, literally anything. Simply place all of the ingredients into a blender or food processor and blend. I find it helps to gently scrape layers of the avocado in to the blender, rather than large chunks of the flesh. You may need to scrape down the sides of the blender after 30 seconds, to ensure everything gets combined evenly, and you aren't left with any lumps. In a bowl, stir the tahini with the agave or your sweetener of choice, and gently mash the berries in, a couple at a time. Alternatively, you can whizz everything up in a blender, for a smoother variations. + Use less tahini if you want more of a jammy consistency/flavour. As I child I have fond memories of walking around the tiny village we grew up in, dressed proudly in devil horns or, in some cases, mummified with toilet roll. An enthusiastic albeit moderate group of children, eyes gleaming, full of hope that the next door we knocked on would promise even more candy than the previous. We’d enjoy a game of apple bobbing, or attempt to eat a ring donut off of a line of string without using out hands, before doing the rounds and disturbing unenthusiastic neighbours, there lack of excitement portrayed in their choice of ‘treats’. (Baked beans, a half empty packet of liquorice allsorts, and even a healthy muesli bar on one occasion, which, as a 6 year old expecting candy, I took as a trick, not a treat. The lead up to halloween was just as exciting. We’d make halloween biscuits or concoct some unruly potions whilst our mothers ‘enjoyed’ making our costumes. Icing and decorating the biscuits was the best bit, even though I didn’t like the taste of icing. Despite a severe case of sweet tooth, I never liked that part of a cake. I actually felt insulted by fondant icing, and although I went with it, was even hostile towards butter cream. I’m much the same now. I ice my cakes with creamy frosting like cashew or coconut cream, as opposed to sickeningly sweet icing. I love experimenting with natural colourings too, using an easy coconut base and simply adding vibrant superfood powders. The recipe below is a sweeter icing recipe compared to nut based alternatives like cashew cream. The creamed coconut is a brilliant consistency to work with, and sets perfectly in the fridge. Mixed with a little liquid, like nut milk, or blended smoothly with cashews, it will become slightly softer which is ideal for cakes, but for biscuits, it is best left as it is. Coconut is an incredibly source of vitamins, minerals and antioxidants, so not only is this recipe completely natural, sugar free and made without artificial colours or flavours, it is incredibly nutritious too. Beat the coconut oil, sugar and honey together in a bowl until fluffy. Then stir in the flour and the nut butter and form into a bowl. If the mixture is too wet, add more flour. Flour a surface and roll out the dough so it is no higher than 1cm. Use cookie cutters or a knife if you are free styling, and make your desired biscuit shapes. Arrange them onto a baking tray, either greased or lined with baking paper, and place in the oven for 12-18 minutes. Meanwhile, make the icing. Fill a small bowl with boiling hot water and sit the bar of creamed coconut inside. (Make sure not to cut the plastic at this stage). Leave for a few minutes, and when the water is cool enough, start to massage the creamed coconut to encourage the mixture to melt. When it is soft, remove from the water, cut the plastic it is in and pour into a medium bowl. Add your colourings/flavourings of choice (charcoal for bats, turmeric for pumpkins, beetroot for some blood) and mix with a spoon or spatula until the coconut is vibrantly coloured. Remove the biscuits from the oven when they are beginning to brown. (They will be browner than normal biscuits due to the buckwheat flour). Let them cool for about 10-20 minutes before icing them. Once they are iced, set in the fridge for 1 hour until ready to serve. Last weekend in Bath I took my delightful mother to a new coffee shop which apparently had been the talk of the little town for months. Bath is full of independent shops, cafes and eateries, and thankfully, to this day there is still only one Pret a Manger to its name. Don’t get me wrong, with its green juices, boiled eggs, kale chips and raw nuts, Pret is quickly becoming my favourite fast food coffee chain, but, there is nothing quite like a family-run cafe with irreplicable (is that a word?) character. Bath’s finest cafes are cosy, welcoming, beautiful and unique, but of course, they’ve never heard of almond milk or dairy-free baked goods. Their produce is local and fresh and the food is always amazing, but until Mr Twitchett and his Roundhill Roastery came to fruition, the coffee was instant and the milk choices, satisfactory. It’s easy to find milk sourced from the local farmers, which is of course delicious in so many ways, however, if you are detoxing, giving up dairy or completely intolerant to it, your only option is going to be soy. Again, nothing wrong with that, but once you’ve tasted nut milk and are aware of such creamy, flavoursome concoctions of nutrients, there will always be a pang for it. Cue, Society Cafe. As I ordered our almond milk cappuccinos at the counter of Society Cafe in Kingsmead Square, a slice of Lemon, Polenta and Pistachio cake with exquisite beauty caught our eyes. I ordered it without giving it a thought and we sat in awe after our first mouthfuls, painfully vowing that we would wait to continue once our coffees had arrived. It was amazing, and straight away I wanted to create a grain-free, dairy-free and sugar-free version, using coconut milk and raw organic honey instead of butter and sugar. So thats what I done did. + I used amaranth instead of polenta as it is similar in physical features and I thought it would taste almost the same, and create a similar texture. I kept mine raw and I liked that the texture was quite bitty and crunchy, but boiling it first will soften it, making the cake smoother. Amaranth is a seed, similar to quinoa (you could probably use quinoa instead of amaranth, raw or gently boiled, if you don’t have amaranth). Amaranth is a complete protein, is full of vitamins and nutrients and is exceptionally high in fibre. (Guide to Bath coming soon). Makes one large cake. Halve measurements if you want to make several small cakes or really tiny ones, in ramekins. Beat the coconut oil and honey together in a medium bowl, using an electric whisk. In a separate bowl, mix the ground almonds, amaranth (raw or briefly boiled), baking powder and psyillium husk together. Beat 1/3 of the dry mixture into the coconut oil and honey, then beat in one egg. When combined, add another 1/3 of the dry mixture and another egg and beat until combined. Now add the final 1/3 of the dry mixture and the final egg, along with the vanilla extract, and whisk until fully combined. Stir in the lemon zest and pour the mixture into a tin or ovenproof dish, greased lightly with coconut oil. Meanwhile, juice the lemons and pour the juice into a small bowl, with the honey or agave. Mix together until combined. Remove the cake/s from the oven and let cool before removing the cake from the tin and placing it gently onto a plate. Stab gently at the surface of the cake with a fork and pour the lemon and honey mixture over the cake. Watch it soak into the cake, then leave in the fridge until ready to serve (it becomes even more dense, chewy and moist in the fridge thanks to the coconut oil), or serve right away. I enjoyed it with Buckwheat Yoghurt (recipe on the Qnola website soon), but cashew cream or coconut yoghurt will suffice. And the frosting below isn’t mandatory, but it is certainly advised. + You can also used creamed coconut instead of the Cashews and Raw Honey or Agave. Place the cacao butter and cashew nuts into a food processor or blender and blend for 2-3 minutes, until smooth. Now add the avocado, scraping at the flesh to gradually release it from the skin so as not to overwhelm the blender with large chunks. Add the sweetener and lemon zest and blend for another 1-2 minutes, until everything is combined and the mixture is smooth and a whipped consistency. Spread onto your cooled cake/s. This icing is prefect for any cake, and works especially well on cacao cake, banana bread and blueberry muffins. + If you don’t like lemon flavoured things, this cake works just as well without the lemon, and this frosting is delicious on the plain vanilla and berry sponge. Alternatively, you can use fresh orange juice instead. I recently had a conversation with my make up artist on a shoot about how good crunchy food is. Sometimes, we agreed, we don’t even crave sugar or food at all, we just want something to munch on. Biscuits are the devils. Made predominantly from butter, sugar and flour they are so simple yet somehow so incredible. The perfect snack and the perfect accompaniment for a hot drink. I was recently back and forth in emails giving health advice to a full time teacher who complained that it’s all well and good eating healthily and taking leftovers for packed lunch, but there is no escaping the staff room and the morning break-time snacks. I came up with this recipe as a simple and portable snack to make at home and take to work if office snacks are hard to turn down. I also think it is a great idea to have these in a jar or to make fresh for guests, so that you have something to offer them that you can enjoy with them. The look on my grandmothers face when i turn down the offer of a biscuit with my tea is so painful, I needed to come up with something. I made these for a group of guests over the weekend whilst I was moving house and they are completely gluten, wheat, dairy, grain and refined sugar free. I made mine similar to chocolate digestive biscuits, but you could easily make the biscuit and leave it plain as there is plenty of flavour from the vanilla, salt and coconut palm sugar. You could also add ground ginger for a healthy gingersnap variation, or a mixture of spices to make chai biscuits - amazing with hot drinking cacao. If you want more of a proper cookie, add chopped chunks of raw chocolate to the mixture and leave them about 1cm in depth instead of flattening them down. You can top yours with cashew cream instead of icing, or stick two biscuits together with a spoonful of cashew cream in the middle to make a delicious cookie sandwich. Use an electric whisk to beat the coconut oil until it softens and becomes slightly fluffy. Scrape down the sides of the bowl and make sure the coconut oil becomes a good soft consistency before continuing. Next add the sugar, vanilla, salt and cinnamon and beat again for 1-2 minutes. Add the almond butter and whisk again until everything becomes completely combined and the mixture becomes light and fluffy. It will look darker in colour than usual biscuit or cake batter but this is just the caramel colour of the sugar. Scrape down the sides of the bowl to ensure everything is combined and gradually add the water, before whisking one last time. Now, taking a wooden spoon, add the flour bit-by-bit and mix gently but thoroughly. When all of the flour has been added, give the mixture a final vigorous beat with the spoon before taking a tablespoon of the mixture at a time to flatten in your palms. If the dough is too wet and sticks to your hands, add a little more flour. You can also use a rolling pin and a circle cutter (or any shape for that matter) to separate into biscuits, but i always get frustrated when the dough sticks to the surface. I made the tablespoon of dough into a ball and then used the heel of my hands to gently flatten it into a circle. Grease a baking tray with a little coconut oil before arranging the uncooked biscuits. Bake for 10-15 minutes, until the edges begin to brown slightly. Remove from the oven and place on a cooling rack in the fridge for at least 20 minutes. They must be completely cool before you add the chocolate or things will become extremely messy. If you are leaving them plain however, eat the straight away whilst they are still hot with a glass of almond milk or a cup of herbal tea. In a small bowl, melt the coconut oil in a microwave, or melt it in a small saucepan on the hob. Remove from the heat and whisk in the raw cacao powder until it is fully dissolved. Add the agave and salt and stir to combine. Leave aside for 5-10 minutes to let it thicken slightly. Now, take a pastry brush or something similar and brush the melted chocolate onto the cooled cookies. If you do not have a pastry brush you could try using a spatula or just dunking one side (or both - it’s entirely up to you) into the bowl of chocolate. Place them onto a plate and put them in the freezer for 2-3 minutes to set. Repeat this 3 or 4 times depending on how thick you want the chocolate layer to be. You could even sandwich two biscuits together, painting both flat sides with chocolate 2 or 3 times before finally pressing them together. Then leave them in the freezer to stick. One of my most improvised, made-up-on-the-spot recipes, yet thankfully one of the most successful. Home in Bath my ingredients are limited so i made this recipe up completely from scratch, using whatever i could find and trying to figure out which nuts i could grind into a flour and which seeds i could use as a sort of gum alternative (to make the dough stick together). With a baking cupboard full of nuts and seeds and a spice rack to die for (nice work, mum) i ended up with some incredible crackers to accompany our lunch; full of flavour (i got carried away with the herbs) and extremely light and crispy. I never miss crisps that much but when i see them or think about the sheer delight that they used to bring me when i got home from a night out, i suddenly feel desperate to recreate them, healthily. These are in no way similar to thin, oily potato crisps but aren’t too far from being mistaken for a Dorito (minus their suspicious powdery coating). However, mix some nutritional yeast with some paprika and, voila: the ultimate natural, gluten-free tortilla chip! For a popadom alternative (yes i know, possibly the most versatile cracker on earth but seriously you can alter them to go with anything) just add ground cumin, garam masala and onion seeds and use to scoop up your curry. Grind the chia seeds in a spice blender or if you dont have one of these just leave them whole. Place the chia seeds, ground almonds and ground sunflower seeds into a bowl and mix until combined. Add 2 tablespoons of water and mix again. The chia seeds will soak up the water immediately so you may need to add a little more than anticipated. Add the quinoa flour, salts, herbs and baking powder and mix again with a whisk or a wooden spoon if it becomes too thick. Add the remaining 2 tablespoons of water and mix again. Add the egg and mix thoroughly before stirring in the coconut oil. If the mixture looks too wet, add a little extra flour. If you want a smoother cracker, add this mixture to a blender and blend for 2 minutes until the dough becomes a smooth paste. Transfer back into a bowl and you’ll probably need to add a little more flour. I left mine unblended and the whole seeds gave it a brilliant texture. Grease a baking tray with coconut or olive oil. People tend to use baking paper but i find, especially with things like dough, if it sticks to the paper there’s absolutely no separating them. Spread the mixture onto the greased baking tray (you may need two baking trays). Evenly spread the mixture and flatted with the back of a spoon or a spatula until it is between 2-4mm thick. The thinner you manage to get it, the more crispy they will be and perfect for dips. If you leave it thicker they’ll make perfect crispbreads or flatbreads for sandwich toppings (like an open sandwich) or even as a pizza base alternative. Anyway, spread the mixture so that it forms one large cracker that you can cut after the cooking process. Top with nuts or seeds of choice and another little sprinkling of salt and place in the preheated oven. Bake for 10-20 minutes but check regularly. The sides will brown first so be careful not to burn any of it. If the middle doesn’t seem quite done, take it out anyway as it will continue to cook slightly and will crisp as it cools. For a pizza, the middle would be perfect still a little doughy, but for a crispy snack you can always double bake the middle portion of the mixture once it has cooled and you have separated the sides and set aside. Perfect for brunch or lunch topped with mashed avocado, scrambled eggs, smoked salmon, bacon or ham, chicken and spinach leaves or houmous. Alternatively, spread with a little coconut oil and dip into soup or use to mop up your curry. Following the great success of my miracle bread I wanted to have a go at a different bread recipe. The miracle bread was easy to make and i had a lot of feedback from people who have given it a go. I miss bread all the time and whatever gluten free bread i find in stores is usually full of things like rice flour, potato flour, tapioca starch, sugar, preservatives and flavourings. This recipe is made primarily from nuts, seeds and vegetables, meaning even in small doses it will help increase your omega 3 intake for the day as well as the amount of protein in your diet. With essential fatty acids and Soup is not the same without a warm piece of toast, and burgers (with organic meat and no fillers) are never as good wrapped in lettuce. So, I thought, it’s about time I made some bread rolls. This recipe is quite similar to my Miracle Bread although it uses eggs and vegetables as well as buckwheat flour. The vegetables increase the nutritional levels of these rolls and the eggs, as well as helping to merge the other ingredients together, increase the protein levels of the recipe. Initially I was going to keep this recipe plain so the rolls could be enjoyed sweet or savoury. The recipe will make a delicious sweet version if you omit the green vegetables and perhaps the herbs, and if you add a little sweetener such as agave or coconut nectar. I would recommend adding chunks of raw or dark chocolate or cacao nibs too, to increase the flavour. The texture of these buns is quite similar to that of a muffin or a scone almost. I think they are perfect toasted as a bun with grilled chicken or steak sandwiched in the middle. They also act as a perfect bread muffin for your eggs to sit on, and if toasted enough are perfect with a bowl of steaming, rustic soup. Preheat the oven to 175c. Measure the chia seeds, sunflower seeds, pumpkin seeds, sesame seeds, flax seeds, ground almonds and nutritional yeast and pour into a blender. Grind together into a flour and then transfer into a large mixing bowl. Add the rest of the dry ingredients (the psyllium husk, buckwheat flour, arrowroot, garlic and herbs). Mix together with a wooden spoon and then stir in the melted coconut oil. Next, add the eggs (make sure you have whisked them in a separate bowl before adding). Stir until combined and then add the pureed sweet potato and mash the mixture with a potato masher or a wooden spoon. Gradually add the water bit my bit to loosen the mixture. You may not need much of the water at all but 1/2 a cup will improve the consistency of the mixture if it seems too dry. Add the chopped greens or if you are making sweet bread rolls/buns then add chopped dark or raw chocolate or cacao nibs, or dried fruit - whatever you prefer. Leave the mixture to sit for half an hour in the fridge and then shape into bun shapes or large, slightly flattened balls, at least an each apart on a baking sheet. (Line a baking sheet with baking paper and lightly grease the paper with coconut oil as the dough may stick - and removing that paper is impossible). Cook for 50 - 60 minutes, until the buns are crispy on top but doughy in the middle. Use a knife to test the middle of the buns and if it comes out clean then they are ready. The buns will continue to cook once removed from the oven, so even if you think they seem too doughy, go with it or you’ll end up with dry, crumbly biscuits. Best enjoyed straight from the oven spread with coconut oil or mashed avocado. They also make a perfect dinner party starter and are great for packed lunches or quick snacks. This is one of my favourite recipes and I've made it time after time for guests, occasions, event catering and, well, for myself. A lot. It's one of those things that looks extremely unpromising as it goes into the oven, but comes out looking, smelling and tasting like nothing on this earth you have ever tried before. It is a bonus, then, that they are gluten, grain, dairy and sugar free. The base was inspired by a grain free desiccated coconut flapjack i recently experimented with, and although it is quite unlike a biscuit (common in most lemon bar recipes) it is a thousand times more flavoursome and has a much chewier, cakey texture. Perfect with a hot drink or as a light, healthy after-dinner dessert. These also make great gifts for foodies and health conscious friends and family. Wrap them in baking paper and seal with some twine or some ribbon. Preheat the oven to 175c. Grease a small rectangular oven proof dish with coconut oil or line it with greaseproof paper. Melt together the coconut oil, unrefined syrup of choice, shredded coconut, almond flour, salt and coconut or buckwheat flour. Stir to combine and remove from the heat - be careful not to burn the coconut. You only need to heat the mixture until the oil and syrup have completely dissolved. Add your egg whites to the mixture, saving the yolks to use in the filling, and stir thoroughly until the mixture comes together in a doughy, sticky paste. Arrange the mixture in your prepared dish, using a spatula or spoon to spread the mixture out evenly across the base of the dish, pressing firmly to ensure it is compact to ensure it sticks together nicely. Bake for 10 minutes until the top begins to brown. It may also begin to rise but will flatten again as it cools. If the tops aren't browning after 10 minutes, you should still remove it from the oven, as you will continue to cook it once the filling is on top, so it will all come together in the end. Once you've removed it from the oven, place it in the fridge to set whilst you prepare the filling. Vigorously mix together the eggs and egg yolks, either by hand if you're feeling up to it, or using an electric whisk. Wait until the become frothy before adding the lemon and lime juice, zest - if using, sweetener, ground almonds and chia seeds - if using. Continue to whisk for 1-2 minutes until everything comes together nicely and is still relatively frothy. Pour the filling mixture over the cooked base and bake for another 15-20 minutes. The top should feel spongy to touch and should bounce back slightly when you prod it. If it is too runny, lower the heat and cook for a further 5 minutes. Leave to cool or set in the fridge before slicing and enjoying. It tastes perfectly delicious as a gooey mess, but once it's set, there aren't even words to describe it. Sprinkle with gluten free flour or desiccated coconut and enjoy as they are, or serve with fresh mint leaves and/or homemade coconut cream. + You can also experiment with adding passion fruit to the filling, or homemade apple or mango juice or puree.